The cytologic smear is a simple, rapid, reliable and inexpensive method which has been used for many years. 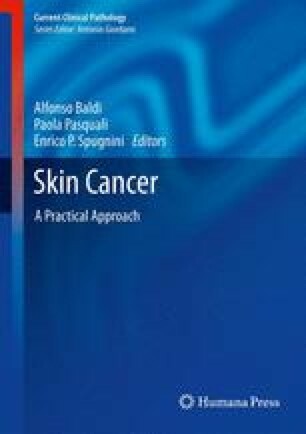 The cytologic smear can be useful as a diagnostic aid for skin tumours based on the fact that neoplastic cells tend to exfoliate easier because of their diminished cell cohesion. Cytodiagnosis of skin tumours can be performed by different techniques, including fine needle aspiration (FNA) and scrape cytology. Virtually any palpable mass or any superficial lesion can be sampled. Furthermore, there are no absolute contraindications. Cytologic diagnosis, like any other test, has some limitations. These may be related to inadequate or insufficient specimens and lack of experience in interpretation of the stained preparations. The major criteria for cytologic malignancy include an increased nuclear cytoplasm ratio, irregularity of the nuclear membrane, irregularity of chromatin clumps, irregularity of nucleoli and nuclear moulding. Basal cell carcinoma (BCC) is the most common skin tumour and one which can be easily diagnosed by scrape test. Cytodiagnosis provides a confirmatory diagnosis at the initial patient visit. It may also be the sole conservative means of arriving at a presurgical diagnosis. This could be extremely beneficial in situations where even a simple 2-mm punch biopsy may be considered inappropriate, such as in a cosmetically sensitive site in a young person or when nonsurgical therapies are planned, e.g. cryotherapy, or in patients with contraindications for the surgery or multiple lesions. Therefore, cytologic diagnosis has a high accuracy rate for margin control in BCC surgery. This application would especially be useful in areas with limited medical resources or in centres where Mohs micrographic surgery cannot be performed. Finally, cytological specimens of cutaneous metastases may be a good method in the identification of unknown primary tumour.